Wiehl/Aachen, 04.12.2018 --- Electric vans are being spotted in more and more inner cities – most of them in the bright distinctive colours of the postal service, delivering letters, parcels and packages. 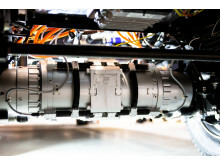 Yet truly heavy loads are soon to be transported electrically, too: BPW is supplying the drive axle technology for a research project at RWTH Aachen aimed at helping the electric lorry achieve their breakthrough. 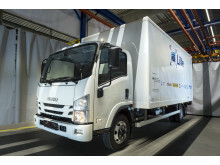 An first vehicle based on the Isuzu N series has now been presented in Aachen. It can carry a gross vehicle weight of 7.5 tons – but where you’d otherwise hear the sound of diesel chugging, there’s nothing but silence. In a game of Top Trumps for cars, you wouldn’t want commercial vehicles in your hand: in this sector, speed, number of cylinders and cubic capacity are trumped by other characteristics. 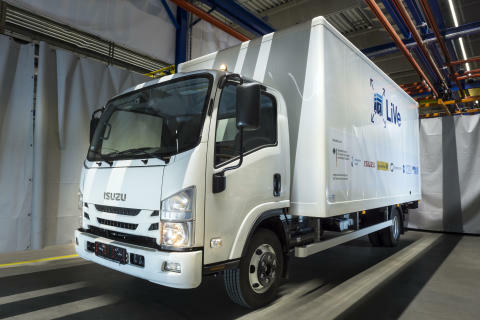 The critical factors for commercial vehicles are usable load and costs – calculated over the vehicle’s entire lifespan. It is these specific parameters which are being addressed by a research project in Aachen: in collaboration with BPW Bergische Achsen and partners Isuzu Motors Germany, StreetScooter and the RWTH Aachen machine tool lab, the ‘Chair of Production Engineering of E-Mobility Components’ (PEM) at RWTH Aachen is now presenting an electric lorry with a gross vehicle weight of 7.5 tons. 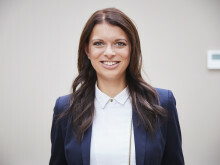 The project is funded by Germany’s Federal Ministry for the Environment, Nature Conservation and Nuclear Safety through the ‘Renewable Mobility’ programme. 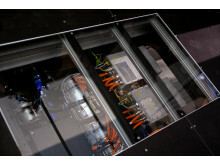 A modular design is aimed at speeding up development and production and reducing life cycle costs. From the outside, there’s nothing to distinguish the vehicle from the Isuzu N production model. What’s different? The 140 kW (or 190 hp) diesel engine is missing. Instead, the drive system is hidden in the rear axle. 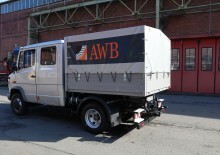 It is supplied by BPW from Wiehl, North Rhine-Westphalia, a leading technology company in the commercial vehicle industry. With 6,500 newton metres of torque, the compact electric drive axle ‘eTransport’ sets a gross vehicle weight of 7.5 tons in motion. 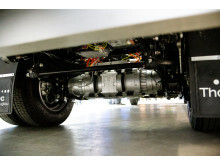 The compact design of the electric drive axle allows completely new vehicle concepts to be realized, as the project is intended to demonstrate. The BPW drive system is currently undergoing pre-production tests and should first appear in commercially available vehicles in early 2019. The company Paul Nutzfahrzeuge is using it to convert special municipal vehicles from diesel engines to electric drives. This is worth the effort, since there is as yet no mass-produced chassis on the market robust enough for heavy transport tasks and associated refitting and conversion. 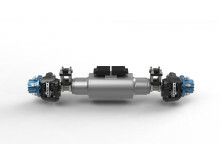 At the same time, BPW is already working on a drive axle with 22,000 newton metres of torque for vehicles with a gross weight of up to 26 tons. 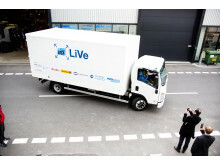 The vehicle dubbed ‘LiVe1’ (an acronym for: ‘life cycle cost reduction in electric distribution vehicles with individually adaptable powertrains’) was unveiled at the ‘prototype factory’ on the RWTH Aachen campus.